Recent developments in genetic technology promise to eradicate disease and disability. Such promises pose challenging questions with regard to our understanding of what it is to be human. Taking a Christian and theologically informed viewpoint, this book explores and challenges our concept of disability. This book will seek to explore the question: does our current attitude toward the use of genetic technologies in contemporary practice risks a slide into social habits which are implicitly evil and destructive of the humanness of our society? The central theological question that will be addressed by the book is: Is the image of humanness that underpins the implicit and explicit assumptions of new genetic technology compatible with Christian theological understandings of what it means to be human and to live humanly? This book aims to explore these questions within a multidisciplinary context with a view to developing an informed practical theological perspective which can guide the theory and practice of the church as it engages with the world around the complex issues that are emerging in response to new genetic technology. John Swinton, and Brian Brock have drawn together an international team of the top scholars from medicine, ethics and theology to produce a unique text which will lay out the complex problems genetic technology raises, and offer fresh understandings and solutions that are theoretically significant and practically vital. About "Theology, Disability and the New Genetics"
John Swinton (Ph.D., University of Aberdeen) holds the chair in practical theology and pastoral care and is director of the centre for Spirituality, Health and Disability at the University of Aberdeen, Scotland. His other books include Spirituality and Mental Health Care; Resurrecting the Person; Raging with Compassion: Pastoral Responses to the Problem of Evil and From Bedlam to Shalom. Brian Brock (D.Phil., King's College, London) is lecturer in moral and practical theology at the University of Aberdeen, Scotland. He has published articles on medical ethics and the theology of disability as well as a monograph on the ethics of technological development. His publications are Singing the Ethos of God: On the Place of Christian Ethics in Scripture (Eerdmans); Christian Ethics in a Technological Age (Eerdmans, 2010); Ed. 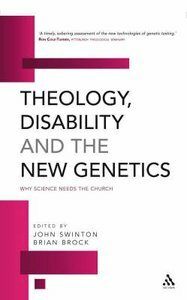 with J. Swinton, Theology, Disability and the New Genetics: Why Science Needs the Church (T&T Clark) and Ed. with E. Harasta, Evoking Lament: A Theological Discussion (T&T Clark). Foreword - Professor Nancy Eiesland; Introduction - Professor John Swinton; Part I: Genetics And The Experience Of Disability; Part Ii: Eugenics And The New Genetics; Part Iii: The Promise Of The New Genetics; Part Iv: Disability And Humanness: Theoretical Considerations.